No vitamins, minerals or herbs can offer the same significant level of pain relief given by heavy-duty prescription drugs. On the other hand, natural herbs for pain relief do not have as many side effects as prescription drugs. They are more cost-effective and do not carry the same risk of chemical dependency. In addition, certain herbs do not only alleviate the pain but can also address the underlying cause of it as well as being beneficial in supporting and healing the nervous system. There are more than 100 herbs for pain relief that can be very useful as a treatment, and not all of them work in the same way. Herbal remedies for pain management are meant to complement, or as an addition, to any existing pharmaceutical pain medication but never as a replacement. Medicinal herbs can be as powerful as pharmaceutical drugs and should be treated as such so it is important to seek the support and advice of a health care provider as some natural herbs for pain treatment may conflict with other medications. Herbal pain remedies can provide a good alternative to non-steroidal anti-inflammatory drugs for chronic, mild to moderate aches and may reduce the need for prescription drugs. 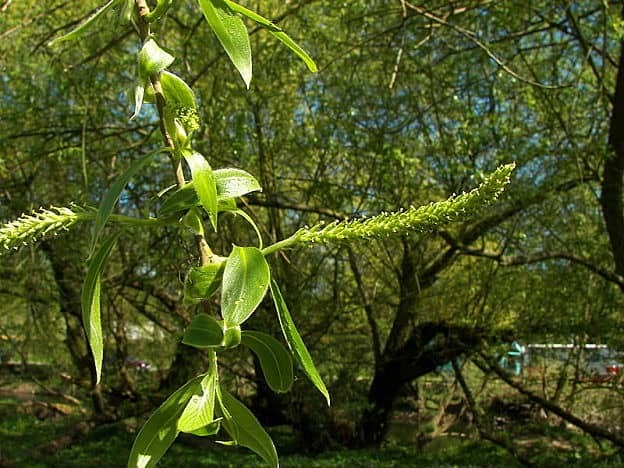 The bark of the white willow has been used since ancient times to treat fever, pain, and inflammation; it is especially useful in treating arthritis. The active ingredient is salicin, which is converted in the body into salicylic acid. This compound was first synthesized by chemists in the mid-nineteenth century. Later acetylsalicylic acid was developed, which is commonly known as aspirin. Both natural and synthetic aspirins decrease pain by blocking the production of one particular group of prostaglandins that serve as pain-messengers. Prostaglandins are a group of hormone-like substances that are produced in all body tissues and serve many important functions such as the contraction and relaxation of smooth muscle, dilation, and constriction of blood vessels, control of blood pressure, and modulation of inflammation. Many people choose to take this “herbal aspirin” over synthetic aspirin because it is free of many side effects such as long-term risks like blood thinning, or gastrointestinal problems. White willow bark is an herbal remedy for both chronic and acute pain in the lower back, joints, or teeth, and can reduce inflammation and fever. The usual recommended dose is one capsule (usually 400 mg) taken one to three times per day. Feverfew is another herb used for herbal pain relief. It is used to stop inflammation and the resulting pain as it also contains constituents that reduce prostaglandin levels. 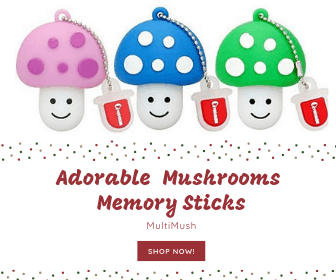 Traditionally it is used as a primary remedy in the treatment of migraine headaches, as it relaxes contracted blood vessels and increases blood flow to the brain. Feverfew may be used to treat menstrual irregularities and stomach-ache. In capsule form, the dosage may be 1-6 capsules daily, or 25mg capsules of freeze-dried leaf twice a day. It can also be taken as a tea by steeping 2-3 fresh leaves in boiling water. It is important not to boil the leaves, as this destroys the active parthenolides. Feverfew is contraindicated for people with allergies to ragweed. Feverfew should not be used during pregnancy due to its stimulating effect on the womb. Meadowsweet contains aspirin-like chemicals and is used to reduce fever and to relieve the symptoms of arthritis and pain in muscles and joints. It is far less likely to irritate the stomach than non-steroidal painkillers; rather, it is soothing to the stomach and traditionally used as an herbal treatment for stomach ulcers. Studies in Europe support the ability of meadowsweet to protect and soothe the mucous membranes of the digestive tract, to reduce excess acidity and to lessen nausea. Meadowsweet is one of the best natural herbal digestive remedies available. Ginger, another herb that inhibits prostaglandin, has a long history in India as a natural treatment for inflammation and pain. It has a powerful antioxidant effect, enhances blood circulation, and promotes gastric secretion. It is used to alleviate digestive cramps and mild pain from fibromyalgia. Externally, it is used in many treatments for muscle sprain and fibrosis. Studies have shown that there are no adverse side effects in subjects who used ginger over long periods of time, even those who continued to take it for more than two years. The recommended dose is 500-1,000 mg a day, although doubling and tripling the dose may bring a quicker relief. A tea can be made from one teaspoon of chopped fresh root simmered in a cup of water for about 10 minutes. Boswellia is a very important herb in the traditional Ayurvedic medicine of India. It is used to soothe pain from sports injuries and is traditionally used to help knee pain from osteoarthritis. The recommended dose is to take 150-400 mg capsules three times daily for two to three months. Devil’s claw has a long history in Africa as an herbal treatment for arthritis, lower back pain, and other inflammatory disorders. The root is the part of the plant used for medicinal qualities; harpagide and harpagoside are the active ingredients. Both of these components are iridoid glycosides that are analgesic (pain-relieving) and anti-inflammatory. Devil’s claw is used in capsule form, prepared as a tea and is used in ointments for external use. The recommended dose for devil’s claw extract (containing 3 percent iridoid glycosides) is considered safe at 750 mg taken three times daily. It is available as a tea, and as a tincture (use 1 teaspoon up to three times daily). It should not be taken with blood-thinning medications, nor should be taken by pregnant women or young children, nursing mothers, or by individuals with kidney or liver disease or digestive system ulcers. 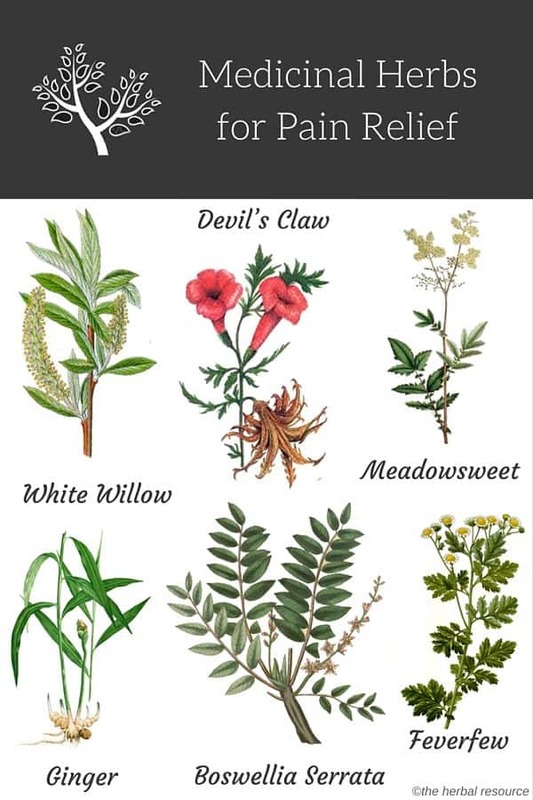 Other natural herbs that have been used for pain relief. It is vital to keep in mind that herbs may still produce side effects or may carry some element of risk (although side-effects and risks are generally less common and serious than in synthetic drugs). The use of herbs for pain should be carefully researched to clearly understand any precautions and contraindications. When buying medicinal herbs a reputable source should be selected, and all the labels should be read for ingredients, instructions, and warnings.